Adapted by the Dominion Strategy blog team from an article by Titandrake. The original article with community comments can be found here. Band of Misfits and Overlord are the ultimate “it depends on the kingdom” cards. Also, they are cards with some of the most annoying rule headaches. Some Action cards, like Wharf, are usually strong, and other Action cards, like Pearl Diver, are usually weak, but some cards are strong or weak depending on context. For example, Noble Brigand is strong if you know your opponents have a Gold in their first 2 cards, and it’s weak if no Silvers or Golds are on top of their decks. Noble Brigand is an extreme example because it goes between “+$1” and “+$1, opponent trashes a Gold, you gain a Gold”, which is a huuuuge shift. However, the power of most Actions depends a bit on context. Consider a classical Village + Smithy deck. Village is contextually strong when your hand has a lot of Smithies and you only have 1 action. Smithy is contextually strong when you have plenty of actions. Or consider a +Buy card – strong when you have a lot of money, weak when you don’t. Or Chapel; strong early when you have a lot of junk in your deck but completely useless late game. What if you could have a card that was exactly what you needed in hand this moment then morph into something else the next? With BoM and Overlord, you can. Band of Misfits and Overlord are most powerful in games where you expect to run into several contexts where the best Action is different. This is because of an obvious observation: if you always play your Band of Misfits as the same Action, you could have just bought that cheaper Action. 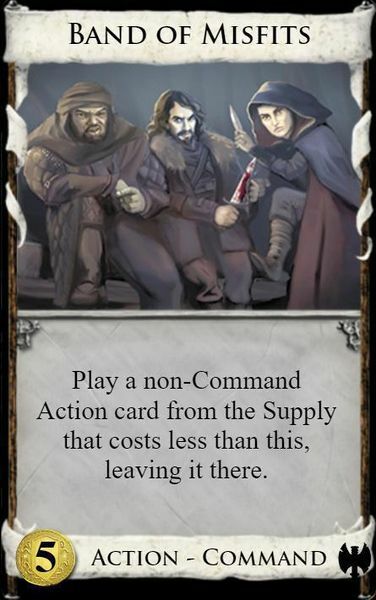 The only way you can get extra value over buying a card directly is if you play your Band of Misfits as different Actions depending on the situation. 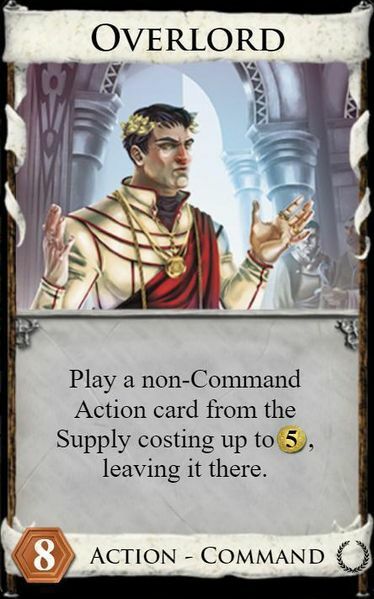 For example, in a game from Dominion Championship 2017, I played Overlord as Rabble (when I needed draw), Village (when I needed the Actions), Explorer (when I had a Province in my hand), Chariot Race (when a previous Chariot Race revealed a low cost card on top), and Catapult (when I had good ammo for my Catapult). If I had wanted all of those effects, I could have bought an actual Explorer, or an actual Catapult, but it would have been much less consistent. I didn’t want an Explorer or Catapult in my deck, because I don’t always want to play an Explorer, or play a Catapult, and having the terminal when I don’t want to play it is wasted space. But a card that could be an Explorer or a Catapult when I needed it, and a Village / Rabble when I didn’t? Sign me up! Band of Misfits can be any card that costs less than it, so it usually can be any card that costs up to $4. However, in the presence of cost-reducers, this is no longer true. In particular, if enough Highways are in play so that BoM costs $0, then it can’t copy ANY card at all, because no card costs less than $0. Overlord does not have this restriction; in fact it becomes stronger in the presence of cost reducers because it can always copy cards costing up to $5. In my experience, Band of Misfits is okay, but often has a lot of competition at the $5 cost spot. A lot of key Dominion cards are priced at $5, and often you want to buy those instead. Overlord, on the other hand, can be incredibly strong because it can be any $5 cost card and you can open with it. Do you wish you could buy that Mountebank or Junk Dealer but didn’t open 2-5? Well, now you can for the low, low price of 8 debt. A common opening is to buy Overlord turn 1, then pay off debt turn 2. This lets you enter the first reshuffle with only one debt while letting you open with a $5 cost no matter what opening split you got. Seriously, if you haven’t tried it yet: just buy Overlord whenever you’d buy a $5 cost Action, or whenever you want to buy a $5 cost but don’t have $5. The benefits of getting to play any $5 cost you need is often worth the debt. There are some trade-offs to having this awesome power to be exactly the card you need at exactly the right moment. If the pile you want to copy is empty, you can’t play BoM / Overlord as that action, which can debilitate your deck in some situations. For example, it’s tempting to use BoM / Overlord as a second pile of an important card that both players are competing over, like Village, but if that pile of Villages runs out, you lose the ability to play BoM / Overlord as that card. This is often the most important drawback to consider when deciding whether to go for BoM / Overlord and can make or break a deck. Copying a Reserve card doesn’t work, because once BoM / Overlord goes to the Tavern mat, it is no longer a copy of that Reserve card, so you can’t call it anymore. Additionally, there are two positive fine print details you should keep in mind. First, when Adventures tokens (+1 Card, +1 Action, +$1, +1 Buy) are on the board, BoM and Overlord get the bonus of both the tokens on their pile and the tokens on the Action they copy. If you have a lot of Overlords, consider placing your most important token directly on BoM / Overlords, instead of the Action you normally copy. Finally, for Conspirator, BoM / Overlord count as two separate Action plays, since you first play the BoM, then play the action it copies. Despite all the rules details, the main idea of BoM / Overlord is simple: they can be the card you need when you need them, but whether you want them at all depends on the kingdom cards they can copy. This entry was posted in Articles, General Strategy, Uncategorized. Bookmark the permalink.